Give people a reason to smile when they see you dressed to impress with a modern fit wool suit by ZeGarie. Featuring Italian style and design, this 3 piece suit has the modern style and modern fit to get you noticed. 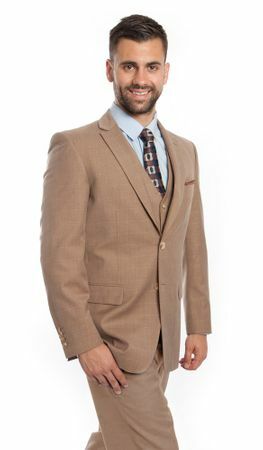 This well tailored beige color suit has a square pattern design that is made of fine wool. The pants are flat front style and the jacket has double rear vents in the back that show Italian attitude and style.